Well, folks, here we are at last. The final debate over healthcare and who gets it and who doesn’t. That’s right, it’s time for the Big Showdown in the halls of supreme justice as people we’ve never met are arguing in front of the Divine Nine the pros and cons of providing healthcare for everyone centered around the single hurdle, is it constitutional? It’s very ironic that our current healthcare system is discriminatory which, according to our constitution, is unconstitutional. Providers discriminate daily. Hell, hourly! It may not be because of race, religion or creed, however, which lets them bypass the actual law. But walk in there to apply for insurance with a history of cancer or diabetes and see what they say. Yep, the answer is “No”. But because those words “and regardless of medical history…” in the discrimination clause of our glorious constitution they get away with it. And, the result is mass of people who can’t get healthcare when they need it most. The reason is simple. Healthcare providers want to insure only healthy people so that YOU will NOT USE your benefits and they will reap HUGE PROFITS, their stock goes up and the CEO’s get big bonuses. Welcome to the world of ‘healthcare for profit’, ladies and gents. 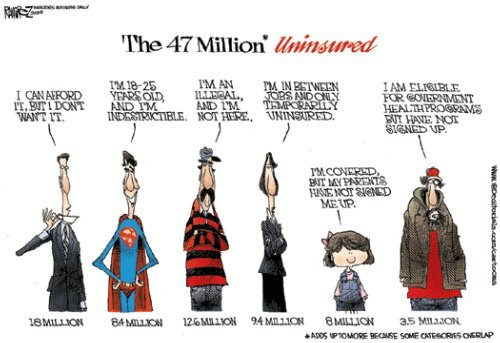 And, if the conservatives get their way with the Divine Nine’s ruling overturning the health care act, the pool of uninsured will become even larger. Maybe 100million. Who knows! As the insurance companies continue to nitpick, create restrictive guidelines, jack up premiums for pre-existing conditions, etc. etc. then it will only be available to those who never need it. I’ve been pretty healthy all my life, no chronic diseases, no surgeries, etc. But, i’m fast approaching 60 and am self-employed. Premiums are outrageous for less and less coverage. Basically they are pricing me out of the market. I’m at the tail end of the baby-boomer generation and with all these boomers reaching the 60-70 age range in one big lump is sure to cause concern for the bean counters at the big insurers. I have a relative, 62 years of age, married and retired (husband is same age). They pay for an insurance policy for the two of them a whopping $800 per month. That gets them a $20,000 deductible! That’s just under $10,000 in premiums annually and a total of $30,000 out of pocket before the insurance company pays a dime. I don’t know about you but I know I don’t have $30,000 lying around nor do I wish to pay $800 per month for services that I don’t even know will reliably cover what I need when I need it. Each of my previous claims of any sizeable nature were all declined (in one case they simply cancelled the policy over a technicality when the claim was for $48,000 involving my stepson). As they say, health benefits are great to have as long as you don’t need them! It’s no wonder that of the million+ bankruptcies filed annually the overwhelming majority are from medical bills. We’ll see this figure rise sharply over the next decade as one thing fuels another. More bankruptcies means no payment for medical expenses which drives up those costs to cover the losses which raises medical insurance premiums, etc. etc. etc. until there’s 5 million bankruptcies annually and 100+ million people without insurance. It’s a trainwreck we can all see coming but can’t get out of the way. The ONLY way that all Americans will get health care benefits is if ALL Americans participate in the pool. This means the healthy and the sick. Regardless of who is in office, this is a basic concept for total inclusion. The independent insurance companies have stated they would offer unrestricted benefits ONLY if everyone participated. This is the fundamental clause in the health care act that they are arguing this week. If the healthcare act is overturned by the Supreme Court then my prediction is 30 more years before any changes are made in our health care system.